The mysteries concerning the different monads in man's constitution are extremely recondite, and in virtually all ancient literatures far more attention has been paid to the intermediate portion of man than to the other monadic centers or foci of consciousness which make him the complete septenary (or denary) entity that he is. In Christianity little attention has been paid to the complexities of man's being, and all Christian theologians seem to have been satisfied to look upon the human being as composed of three basic elements: spirit, soul, and body. Even here there has reigned from earliest Christian times a confusion as regards the distinction between man's "spirit" and "soul"; and most theologians seem to have considered these terms to be practically synonymous. Yet there would seem to be little doubt that immediately after the passing of Jesus the avatara, and for some uncertain term of years, a distinction between "spirit" and "soul" was kept clear in the minds of Christian writers. The "spirit," in these early years of the Christian era, was looked upon almost as a divine thing: a "child of god"; the "soul" was frequently called psyche, from which Greek word the modern term "psychology" is derivative. Furthermore, in the New Testament one may read of a "natural body," of a "psychical body," and of a "spiritual body." It is worthy of note that the New Testament also speaks of the psyche as being "demoniac" or "devilish"; not that the psyche was the characteristic form of devils or demons, but that by contrast with the spirit in the inmost of every human being, the psyche or the "soul" was so imperfect that it was spoken of as "devilish." This distinction between spirit and soul has universally been prevalent in the philosophical and religious thought of mankind, and the great sages have always taught that just because the individual man is an integral portion of the universe, therefore he copies in his constitution precisely what Mother Nature, his parent, herself contains and is. They taught that both the universe, the macrocosm, and man, the microcosm, are composite beings consisting of an exterior physical vehicle called the body; and of inner powers and faculties with their respective inner vehicles through which they express themselves, which in the case of man, form the Golden Chain from the divine down through the soul-part to the astral and physical vehicles. It is the soul-part which is the intermediate part of man's nature, often called the "human soul," corresponding to what in the universe is the "Oversoul" — adopting a word from Emerson. 2. Buddhi: The faculty or spiritual organ which manifests as intuition, understanding, judgment, discrimination, etc. It is the inseparable veil or garment of the atman. 3. Manas: This is the center or organ of the ego-consciousness in man (and in any other quasi-self-conscious entity); and is therefore the seat or producing cause of the "I am I." 4. Kama: The organ or seat of the vital psychoelectric impulses, desires, aspirations, considered in their energic aspects, and therefore the elemental or driving force in the human constitution. As every one of the seven principles is itself septenary, there is a divine and a spiritual kama as well as a grossly emotional kama, with all intermediate stages. 5. Prana: or Life; more accurately, the electromagnetic veil or "electrical field" manifesting in the human individual as vitality. 6. Linga-sarira: The astral or model-body, slightly more ethereal than the physical body; the astral framework around which the physical body is built, atom for atom, and from which it develops as growth proceeds. 7. Sthula-sarira: The physical body. This, strictly speaking, is no real "principle" or elemental substance at all, but functions as the common "carrier" of all the inner constitution of the human being during any lifetime on earth. *The atman is the “I am” or essence of Self in each individual; whereas the Ego, the “I am I,” is a subordinate faculty; being the reflection or turning of the consciousness of the essential self upon itself. The Ego might seem to be at first scrutiny the superior, but this is a superficial understanding of the fact, because without the “I am,” the “I am I” is non-existent; for the “I am” is eternal and is whether there be an “I am I” to reflect it or not. To use a figure of speech, the “I am” is the solar light or ray; when this is reflected from the moon it becomes the lunar or inferior light. Since man is a microcosm, one could apply these seven principles or elements to the universe itself. The only objection to such application is that these seven principles have from immemorial time been restricted to the constitution of microcosmic entities such as man. Furthermore, this septenary list is to be construed as defining the constitution of man as being composed of Elements or Principles, rather than as knots or foci of different monadic consciousnesses. Cosmic Monad: The Monas Monadum of Pythagoras and the ancient philosophers. The supreme monadic Self of any cosmic hierarchy. The root from which flows forth in descending serial order all the other six principles or elements of the universe, each evolving or unfolding from the one preceding. The First or Unmanifest Logos. 2. Alaya. Adi-Buddhi or Maha-Buddhi or Cosmic Buddhi. Akasa or Pradhana. The Root or Essence of Mahat, Cosmic Aether: The seat or origin of the cosmic soul; the source of all intelligent order, regularity, and "laws" in the universe or hierarchy. The Second or quasi-manifest Logos. 3. Mahat or Cosmic Mind, Anima Mundi, Intelligence, Consciousness: The source or center of all monadic individualities in the hierarchy; individualized intelligence, mind, consciousness, as contrasted with the universal as in No. 2 above. The Third or so-called Creative Logos. The manifest Purusha-Prakriti. 4. Cosmic Kama: The "Desire" of the Rig-veda, which Desire is pure impersonal universal compassion; the source of the cosmic impelling energies of the universe involving the living intelligently electric impulses thereof. The womb of fohat, considered as the motive yet intelligently guided force or forces of the hierarchical universe. The cosmical psycho-electro-magnetic field; the fountain and source of the cosmic vitality permeating all beings and things in the hierarchy and from which all these individuals derive their respective pranas. 7. Sthula-sarira: The physical universe — the outward shell or body of the six more ethereal element-principles. The astral light is the great reservoir as well as crucible in which all the emanations of the earth, whether psychical, moral, or physical, are received, and after undergoing therein a myriad of ethereal alchemical changes are radiated back to the Earth (or to any other globe in the hierarchy), thus producing epidemic diseases, whether these latter be physical, psychic, or moral. It is likewise the seat of all the vile emanations which the earth radiates. In consequence in the astral light are found the lower degrees or stages of the kamaloka. All these Elements or Principles both of man and the universe are to be strictly understood as interpenetrating each other. It is only for the sake of convenience that the different items in the lists are placed one above another, and this is done solely to suggest the increasing degree of ethereality from the lowest to the top. Furthermore, beginning with the highest or most spiritual, each principle or element flows forth from its immediate superior. Thus No. 1 evolves forth or emanates No. 2, which thus possesses not only its own individual characteristic or svabhava, but contains likewise somewhat of the svabhava or characteristics of its parent; similarly No. 3 is emanated from No. 2, and thus contains in its growing complexity and differentiation not only its own individuality or svabhava, but likewise the respective svabhavas of No. 2 and No. 1; and thus down throughout the list to No. 7, which is the differentiated "carrier" or "manifestor" of all the other six. It is likewise to be noted that the higher become progressively weakened the farther the process of unfolding proceeds downwards into the material spheres. Each one of these various grades from the highest to the physical, is itself septenary (or denary). In other words, each one of man's centers of consciousness or monadic knots or foci has its predominant or svabhavic characteristic, which distinguishes it from the svabhavic characteristics of all others. Using the seven colors of the solar spectrum as an illustrative picture, we may say that each such monad of a human being's constitution has its predominant color, although at the same time containing all the other colors of the pneumatological-psychological spectrum. Manas, for instance, comprises all the seven colors of the entire human constitution, but its characteristic color is manas-manas, or manas per se. Similarly again, kama contains all the seven colors or forces: it has its atman, its buddhi, its manas, and all the rest of them, but its svabhavic or essential characteristic is kama-kama. It is for this reason that the atman, the ultimate source of man's being, is enabled to emanate from itself all the differently "colored" element-principles. Man, therefore, is built of elements drawn from the cosmic reservoir. Yet from another point of view man may be considered to be something other than a mere "bundle of cosmic energies." He is, in fact, a series of consciousness-centers or monads. There is, for instance, a divine monad, a spiritual monad and an intellectual monad or agnishvatta; there is also a psychical monad, which is man as he is at present; a beast-monad; and even the lowest triad — prana, linga-sarira, and sthula-sarira — imbodies what one might call an astral-physical monad. A simple illustration may make this thought clearer. The sun emits rays of many kinds. One of these rays, for our illustration, enters a darkened room which we may call the material world, where it appears as a beam of light. Pass this light through a prism and you get the seven prismatic rays, each one of which actually is a light of its own color; yet the seven unite to form the constitution of the solar beam. Each one of these prismatic rays has its origin in its own solar monad; just as in man's constitution there are the various monads all working together, so the seven prismatic rays work together to make the solar beam. The origin of the beam is the inner god or solar divinity sending forth from itself the seven children-monads or seven prismatic rays. Let us say that one of these seven rays of the beam is the highest, the efflux of its divine monad. Another is the ray flowing forth from its spiritual monad; still another is a ray flowing forth from its intellectual monad; and so forth down the scale. Thus even the humble shoemaker of Gorlitz, who lived at the end of the sixteenth century, taught that man is but the replica in the small of the macrocosm. It must not be imagined that the seven principles are one thing, and the monads something else which work through the seven principles. From one point of view we are studying the "stuff" of which the universe (and therefore of man) is built, from the other point of view we fasten the attention upon the universe (or man) as a vast aggregate of individuals. Not only are the seven principles the sevenfold "stuff" of the universe, but the higher part of each stuff is its consciousness-side, while the lower part is the body-side through which its own consciousness expresses itself. Thus it is that every monad, every consciousness center, is sevenfold: each has its atman, buddhi, manas — right down the scale. Sthula-sarira, for instance, does not necessarily mean physical body; it means substantial body, gross body, of whatever plane, whether it be physical, spiritual or divine. Every point of infinity is a consciousness-center, therefore every point of infinity is a monad, built of the seven stuffs, the seven element-principles of the universe. Buddhi Spirit The essential or spiritual Self. This, which is the perpetual root of man's constitution, lasts in uninterrupted activity on its own plane throughout the entire length of the galactic mahamanvantara. The divine-spiritual monad, unconditionally immortal for the galactic period; the source whence flows forth in serial degrees all the lower portions of man's constitution. Kama Soul The seat of the human ego, which is dual: composed first of the higher portion which aspires upwards and which in its essence is the reimbodying ego; and second, of a lower portion, attracted downwards to the realms of material existence, which is the ordinary human ego. Shortly after death, the reincarnating ego is attracted to the upper duad; and the lower portion falls apart and is mortal. Sthula-sarira Body Mortal throughout; not in its life-atoms, but as a triadic vehicle of vital-astral and physical forces and substances. It will be seen that the upper duad is the seat of the characteristic spiritual individuality, which characteristic individuality is the svabhava of a being. Whereas its life-term lasts as long as the mahamanvantara of the galactic universe, nevertheless this does not imply its ultimate extinction. When the galaxy itself shall have reached its final term of manvantaric activity, it will then sink into its galactic pralaya, carrying along with itself everything within it, gods, monads, and atoms, which are then swept out of merely manifested or differentiated existence like dried leaves in the autumn winds — all of which will reappear when the galactic pralaya has reached its end and will then bring a new cycle of galactic manifestation, but on a somewhat higher plane. We notice that the intermediate duad is the seat of ordinary human consciousness, which is a dual being, composed of a spiritually aspiring part, commonly called the reincarnating ego or the higher manas; and a lower part which is heavily weighted with emotional, psychical, and astral psychomagnetic characteristics and thus strongly attracted to material things. Hence this lower part is the knot or focus of consciousness which expresses itself as the ordinary human ego — unconditionally mortal, because there is nothing in it of a truly spiritual character which is capable of raising itself by aspiration toward union with the higher part. Just here we see the reason for the admonitions of all the great teachers to raise the seat of man's self-consciousness out of this ordinary human plane into the more spiritual part of the intermediate duad, so that it may become part of the fabric of the reimbodying ego, and thus attain its relative "immortality." It is in this that the first steps toward masterhood are made, by self-control, self-conquest, and similar moral exercise. The mahatma is he who through a number of lives has succeeded in raising the lower "soul" to become "at-one" with his spiritual nature. When this is achieved, he becomes a spiritual man on earth; in his larger completion of it, a man-god. He can then at will pass from body to body, and continue uninterruptedly his great work as a member of the Brotherhood. 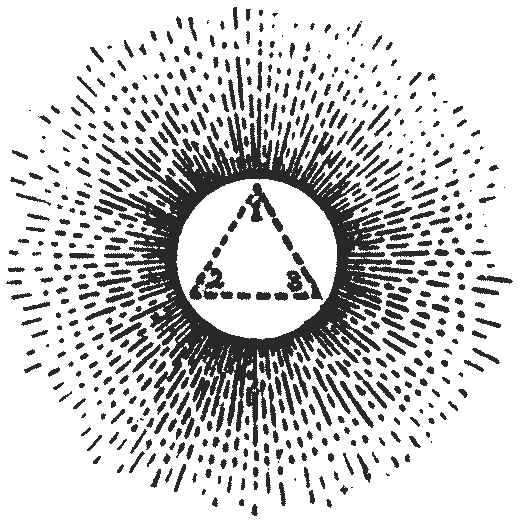 As to the three elements which form the lower triad, these are unconditionally mortal considered as an aggregate; although the respective seed-elements of each, being drawn from nature's cosmic reservoirs, are in themselves and considered as cosmic principles, immortal per se — at least in their spiritual essence. Even the sthula-sarira, or physical atomic hierarchy of the human body, is composed of cosmic elements, in their turn formed of atomic entities, which, although subject individually to bewilderingly rapid changes and reimbodiments, nevertheless are more enduring as entities than is the aggregated physical body which they temporarily combine to form. It may be of some interest to say that every one of the organs of the human body is the representative of one portion of his complex inner constitution. In other words, every one of the monadic centers or foci of consciousness within man has its own corresponding organ in the physical body, each such organ functioning as much as it can according to the characteristic or type-activity of its inner and invisible cause. Thus the heart, the brain, the liver, the spleen, etc., is each one, the expression on the physical plane of a corresponding consciousness-center in the invisible constitution of the sevenfold man. The luminous star in radiation in the diagram is the divine-spiritual link with the cosmos and may be considered to be the "root" formed of three principles or spiritual elements, which in one sense can hardly be said to be above the atman, but are the atman's most glorious origin, represented here by the symbol of a "star" or radiating light, containing at its core a dotted triangle suggesting its triadic divine-spiritual root. In the West, true psychology is practically an unknown territory of knowledge, although during the last fifty to one hundred years "psychology" has become virtually a word to swear by. The pity of it all is that Western psychology is little better than an investigation of the lower portions of the human mind and emotions, and verges commonly on what one may call the higher aspects of physiology. All the higher parts of man's constitution seem to be looked upon as by-products of the human psyche and therefore having little reality. But the exact contrary of this is the fact; for it is the spiritual and higher intellectual qualities and functions which are the substantial basis or root of man, and it is their feeble reflection in the brain and nervous system after their passage through the psyche of the human constitution, which produce the strangely varied phenomena that man evidences — particularly when the body is more or less diseased or functioning imperfectly. It is rather absurd that it is the debilitated constitutions which are taken as standards upon which to base studies concerning the human psyche. The truth concerning the human psyche should be sought for in the normal individual as far as such a norm can be found. What is the human psyche after all? The ancient Greek and Latin Stoics have explained it by referring, at least tacitly, to one of the early doctrines of the Greek Mysteries to the effect that the human soul — called psyche, from the Greek root psucho, "to grow chilled" — was so called because through becoming servile to base attractions, the lower part of the human "soul" sank into the deeps of cold matter and thus lost its intrinsic spiritual fire. Its wandering in the lower realms of matter took it ever farther, at least for ages, away from the Central Fire which thrills through the cosmos. It is thus this intermediate psychological veil of consciousness that beclouds our human vision. In proportion, however, as we succeed in going within and behind this veil, the higher and more penetrating grows our intellectual power, the keener becomes our spiritual vision, the more instant our intuition, and the nobler are the impulses of the heart springing forth in sympathy and love for all that is. If we then group all the attributes and qualities of the lower intermediate nature of man under the term psyche, we should likewise group all man's noblest attributes and qualities under some equally significant term, and perhaps no better one could be found than to turn to the Greek from which the word psychology is drawn and describe the seat of these higher functions of the human constitution under the term pneumatology. One of these days our scientists will realize that the West is but reopening fields of investigation concerning man and his nature and characteristics which are a very old story in other parts of the world, as in India for instance, where the entire constitution of man has been studied from time immemorial. This great spiritual fact is the basis of every system, whether religious or philosophic, of the ancient world; and the philosophical and religious systems of European civilizations, ancient and modern, are of worth in exact proportion as they emphasize this greatest of spiritual truths. If the theosophical movement did nothing else than to restore to the West this consciousness of a common origin for all men, it would well merit the highest commendation and gratitude of the human race. We have thus before us the picture of the human constitution as a threefold entity: first, a highest principle of unimaginable splendor, the flowering of long ages of evolution; second, the intermediate part, likewise the product of ages of evolution, but still imperfect, and therefore still more-or-less subject to the interacting play of the various forces resident in ethereal substance surrounding it; thirdly, the vital-astral-physical element. Yet even this triad, although purely mortal as a compounded structure, is itself the emanation from its own monadic center, the lowest in the human constitution. According to ancient legend and story, it is not only a possibility but actually a frequent occurrence for the human soul temporarily to undergo a partial dislocation from the vital-astral-physical vehicle. The upper duad of course remains in relative control of the intermediate portion which temporarily stands apart from the lower triad; and this leaves the body still vitalized, still, to all appearances a normal human being, still receiving, but in a minor degree, the stream of spiritual-intellectual individuality pouring forth from the two superior duads. The physical man lives; and, as far as physical eyes see him, he is, to all appearances, exactly what he was before. The man still thinks, goes about his work, and persists in all the customary paths of personal activity; but in actual fact he is, for the time being, a spiritual and psychological cripple. However, were this dislocation complete, it would bring about the death and dissolution of the lower triad. The quasi-"absence" or temporary "dislocation" of the psychological apparatus of a man, from the remainder of his constitution, is so common that it occurs to everyone. The most common case in which this occurs is that of sleep. In sleep the personal man is absent, in other words, non-manifesting through the physical brain; and, in point of fact, it is this temporary dislocation of the intermediate or ordinary human nature which is the ultimate cause of sleep itself. The body sleeps because the personal man is no longer there. Another case is that of trance, a word which is often misused by popular writers on so-called abnormal psychical phenomena. The annals of medicine show that trances are as common to human beings as blackberries in season. A man is in a species of trance when he is absent-minded, for his mind is no longer "there." A man is in minor trance again, when he is oblivious of surrounding circumstances or in "a brown study." A man is likewise in a trance when he has foolishly allowed himself to become the victim of the practices of some hypnotist; and anyone who has seen men and women in the state of hypnosis will realize how dangerous and how wrong the practice is. The reason for the condition in all these cases is that the psychomental apparatus of the human being has been automatically or forcibly displaced from its normal seat; and there remains only the vitalized human body, with its imperfect functioning of the brain-cells and nervous apparatus, stamped as they have been during the life by the characteristic attributes of the individual. Another case of dislocation or "absence" of the intermediate nature is that which comprises the various degrees of insanity. A man is insane because his intermediate nature is "absent," either partially or with relative completeness; or in cases of violent insanity, has been dislocated in relatively absolute measure. We have been discussing certain abnormal or subnormal conditions of the intermediate nature; and it may be as well now to discuss abnormal states of the intermediate nature, which are not abnormal in the sense of being inferior to the norm but superior thereto, or supernormal. While the subnormal cases are all caused by the inactivity of the spiritual nature, the supernormal cases are caused by the intensification of the activities of the upper duad — or what comes to the same thing, the supernormal cases are those in which the spiritual nature is in greater or less degree predominant in the human being. In cases of supernormal activity of the upper duad, the intermediate or mental-psychological portion of the human being is, on its plane, correspondingly highly developed, because it has become translucent to and a willing vehicle of the stream of spiritual-divine consciousness flowing through it from the spiritual soul, the actively individual part of the monadic essence. Thus the monad in man is dominant, and is not hindered in its functions by the positivity and strength of character of the intermediate portion, nor is it absorbed by the individuality of the soul-entity as the spiritual-divine stream of monadic consciousness flows through it into the personal consciousness of the human being. Indeed, the exact contrary of this takes place; for the intermediate nature has become greatly at-one with the flow of the monadic essence, thus producing that wonderful phenomenon of the human race, a man more or less in intimate union with the god within himself. One of the commonest facts of life is the influence which one mind exerts over another, for the human psychological apparatus is extremely open to suggestion, and in extreme cases, to outside control. Now, instead of such an outside influence controlling the psychological apparatus of man, let us replace this influence with the transcendent spiritual stream of consciousness flowing from the individual's own spiritual self or inner divinity. Here we have what the whole evolutionary process is working to bring about — the union of the human individual with his own inner god. As yet such instances are rare indeed. Such demi-gods or men-gods are the spiritual and intellectual forerunners of what all mankind is destined ultimately to become in the far distant ages of the future. When such self-conscious receptivity of the soul-nature becomes virtually perfect, then men may say: "Behold, an incarnate Buddha!" "Lo! An incarnate Christ!" Thus such a demi-god has been truly described in all ages as being an incarnate divinity, because of the ray of the cosmic logos working in relative purity and strength through him, and therefore expressing the divine will and consciousness. Having become at-one with the inner divinity, so far as our own solar universe is concerned, such a great one may be said to have become possessed of omniscience, because his consciousness at will ranges over universal fields. They are imbodied dhyani-chohans considered as spiritual-intellectual monadic rays. Of course, even these differ among themselves as regards standing in evolutionary growth, some being far more progressed than others. There is to be seen here, in this instance, the true and willing resignation of the personal human will to the will of the inner dominant spiritual divinity; and one has only to turn to the history of many of the great world-teachers to realize that whatever their individual histories as received by us may be, the same condition of utterly willing acquiescence of the human individual to the mandates of the inner god is found in their lives also. This shows the wondrous psychological condition of spiritual development which the great ones have attained, rendering them utterly faithful mediators of the inner divinity. For in very truth, the spiritual monad in any man's constitution is the "Father" or parent of all his being. Thus it is that the great ones are not only the human vehicles, but are at the same time the human expression, each one of his own inner god. It is true that every human being is an imbodied divinity, but only in the very few is this individual inner god able to self-express itself. The human nature even of the great ones, so it is said, at times feels the immense burden of their portion of the cosmic work. This human nature, however evolved, is spiritually speaking nevertheless inferior to the spiritual monadic self, and therefore needs rest and occasional surcease. The case of Jesus,* called the Christ, is exactly similar, as regards the psychological mystery of it, to that which takes place in the cases of other great ones undergoing the fearful trials of some high initiation. Probably there has never in the history of the world taken place the inauguration of any great spiritual movement, which has not at the same time involved the utter self-surrender of the inaugurator or messenger — a self-surrender, however, which in all cases has been a joyful one; for the messengers have always known what their work is, at least in general outline, and have always known likewise how sublime and beautiful is participation in this work. *The entire story of Jesus as given in the form of the so-called canonical gospels is a true mythos in the Greek sense of this word; that is, it is a Mystery-tale, descriptive not so much of an historical individual whose name was Jesus, although there did in fact live such an avatara, but is a setting forth, under the cloaking and disguise of esoteric allegory and symbol, of various episodes of the initiation-cycle as these episodes were understood and followed in Asia Minor. Thus various incidents and mythic Mystery-rites have been collected around the figure of the great Palestine Initiate; but such a Mystery-tale, making due and proper allowance for the differences of symbological allegory and changings of names and shiftings of scenery, is as applicable to any great world-teacher as it was to Jesus, around whom this particular Mystery-tale of Palestine or Asia Minor was built as a type-figure. The beautiful New Testament story is not a unique instance of a human figure clothed with quasi-human divinity in the spiritual history of the world, and consequently Jesus, called the Christos, is not a unique and unparalleled world-teacher. It should now be clear what was meant by a temporary disjunction or "absence" of the psychological portion of man's constitution when this takes place with the individual's consent and willing participation: an action which happens in order that the dominant spiritual-divine and noetic energies of the higher self may flow temporarily outwards into the consciousness of the normal human being uncolored by the intermediate part of the man, by his own egoic center of consciousness. When this wonderful mystery takes place, then the man is for the time being wholly allied with his higher self, and becomes the physical vehicle for the transmission of teachings and precepts regarding the greatest mysteries of nature, and the sublimest spiritual truths. Human beings are divisible into three general classes in whom the intermediate or psychological nature is more or less pellucid to the inner light. The first class comprises the vast majority of mankind; those in the second class are very few; and those in the third class are exceedingly few and appear in the human race in cyclical time-periods only. Let us then enumerate them as follows: I. Ordinary men and women in whom the psychological nature is moderately pervious to the light and power of the inner god; II. Messengers and disciples of the sages, and the sages themselves, in whom it is pervious in large measure; III. Avataras, those in whom the inner light is wholly pervious. Class I: As the intermediate part of man is but partially evolved and therefore only moderately pervious to the supernal light of the spiritual monad, hence it is subject to manifold disturbances as well as to various distortions of function which temporarily intercept the stream of spiritual consciousness emanating from the inner essential self. It is customary to refer to conscience, or the voice of conscience, as being an infallible guide, and there is indeed much truth in this intuitive recognition of the part played by the conscience in human life. Yet the voice of conscience cannot be considered a never-failing and utterly sure guide, because although this "voice" originally emanates from the spiritual monad and is therefore an expression of the wisdom of the highest in us, it can function only by passing through the heavy veils of man's imperfect psychological vehicle, and hence its spiritual whisperings often fail to reach us. More accurately, the conscience is really the stored up wisdom and knowledge gained in all past lives, and therefore although emanating from its spiritual source obviously is not utterly infallible. Nevertheless it is a safe and sure guide for man to follow in so far as man is able to hear its admonitory suggestions. If our intermediate nature were fully evolved, if we and our inner sheaths of consciousness were pervious to the rays of the spiritual sun within us, then there would be no dimming of that supernal light, and our conscience would be a truly infallible guide because it would be the voice of the spiritual soul itself. The Great Ones have become such relatively perfected human beings, and in consequence they enjoy more or less constant communion with the divinity within; they know, each one, his inner god and hence the inner voice is always clear and unmistakable and thus an infallible guide. Have we not already long ago said that the soul when using the body as an instrument for perceiving: that is when using the sense of sight or of hearing or indeed one of the other senses — for when we say that we perceive through the body we mean perceiving through the senses — did we not say, I repeat, that the soul is then naturally pulled by the bodily attraction into the world of changing, shifting scenes, and therefore wanders and is confused: that the world whirls around her, and that she is then while under the influence of the senses, like a drunkard? Yet, when she returns into herself she reflects clearly; and then she naturally passes into the world of purity, and into the everlasting and the undying and the unchanging, which are all her own nature; and with these she lives for aye when she is herself and is not attracted away or prevented; and then she ceases her wanderings; and from being in tune with the Unchanging is herself unchanging. Is not this state of the soul called Wisdom? The voice of conscience is usually considered to be moral admonition only, but this is erroneous and arises only because men are more accustomed to look for ethical guidance rather than for inspiration or intuitive guidance from within. The truth is that what are commonly called genius or inspiration or intuition are all derivatives from the one spiritual source of the higher self, from which conscience likewise flows. A genius is one who through fortunate karmic destiny is able to tap (usually unknown to himself) the immense reservoir of the wisdom garnered in former lives, which flows into his brain-mind as impulses or it may be as a stream of intuitive perceptions and inspired thoughts. When our scientists become self-consciously cognizant of the well of inspiration and intuition within each one of them, they will then begin to draw upon this unfailing source of wisdom and of guidance in their work; and from being wanderers in fields of speculation and often of doubt, they will become in very truth Illuminati. When man learns to subordinate his psychological nature to the light from above, then he will be truly inspired. There is also to be taken into account the ever-present urge inherent in the god within us in its attempts to guide us along life's devious ways, in order to raise its "lower self," the human individual, toward a final consummation of self-conscious unity with itself. When the inner god thus leans from its heights and touches its lower brother-mind, there then instantaneously passes from the god a spiritual-electric fire into the being of the one thus divinely touched. When this happens the individual has at last found the Path, because he has found himself. It is the great sages and seers of the human race who through the ages teach their fellow-men to place their feet upon that pathway — still, small, quiet, endless — which is the pathway to the gods themselves. Class II: That of the messengers and the advanced disciples of the sages, and in its highest grades the mahatmas themselves. This class of men and of women stands upon an entirely different footing from Class I in which the dislocation of the psychological apparatus is mostly involuntary. In this second class the "absence" or disjunction of the psychological apparatus is a rare phenomenon; when it does occur it is entirely voluntary, and takes place only when the individual desires it for some noble objective of benefit to mankind as a whole. Through training and initiation the spiritual will and consciousness of these individuals function freely, and can so control the psychological apparatus as to set it aside temporarily, in order that the consciousness-stream flowing from the spiritual monad may pass directly and without intermediary into the ordinary human consciousness. His consciousness is, for the time being, of universal range and omniscience — at least so far as our solar system is concerned. Buddhists speak of this condition as that of the "inner Buddha"; Christian mystics as that of the "immanent Christ"; the philosophic Hindu speaks of it as the "splendor of the Brahman in the heart." There is a subtle point of psychology to be noted here. The svabhavic quality or egoic individuality of the intermediate nature is not entirely abolished in every case of the higher representatives of this Class II. There are in reality two distinct things involved here. We have, first, cases in which the intermediate nature of highly evolved human beings or mahatmas may be set aside for a period, even for the entire incarnation, and always for the purpose of bringing into manifestation on earth a purely divine power uncolored by human intermediary; yet even here for the divine power to act directly on the brain-mind of the human individual, the gap existing between the two is filled by a highly spiritualized psychological apparatus or intermediate nature of a buddha. This is the case of an avatara, technically speaking. Secondly, there are the cases of the highly evolved individuals whose entire constitution has been brought into spiritual line and whose intermediate psychological apparatus functions in entire coordination with the spiritual stream flowing into it from above. These are buddhas and bodhisattvas and the higher classes of the mahatmas. They are, in other words, the most highly evolved human beings who appear at any time on earth, and in whom there is no dislocation or setting aside of the psychological apparatus, because this last through evolution has become entirely coordinated with the inner god. These are the forerunners of what the entire human race will become when it shall have passed out of mere humanity into the state of dhyani-chohanhood. The reader should try to keep these two subclasses of Class II clearly in mind. The buddhas evolve to grandeur; the avataras are "created." All the above may seem to be very strange and vague to the average student, and this only because he knows little about these marvelous mysteries in pneumatology as well as in the real psychology of the ancient wisdom. Every world teacher has been spoken of by his followers or disciples as having been illuminated, so that it has been recorded of them that the face and body shone with splendor; and indeed the ancient Greeks have expressed in guarded language that such appearances of divinities were well-known facts, and that it was during and after initiation that such an environing glory was especially noted. Usually this illumination came from at least a temporary identification of the man's intermediate nature with his own spiritual self; but sometimes, and these are cases of extreme rarity, relatively speaking, it occurred because a great and lofty human being (belonging to Class II) became the channel for the temporary manifestation of a celestial power, when the man became filled with the splendor of an over-enlightening divinity. To make the matter a little clearer, the former cases are they in which the neophyte becomes temporarily clothed with the spiritual and intellectual and vital efflux from the god within him, and this is the accompaniment of the higher degrees of initiation; whereas the latter cases, of relatively extreme rarity, are they in which the individual occupying one of the higher degrees of Class II gives himself up, for a life-time it may be, to become the utterly willing human vehicle in order to bring a divine influence into the world and to perform a divine work therein. The secret lies in the soul-nature, otherwise called the intermediate or psychological apparatus. With due reservations made for the cases of the avatara, all the other instances alluded to are rendered possible because of the complete stilling or coordination with the spiritual monad of the ever-active and impulsive human soul expressing itself as the psychological apparatus. This is an organ that, however useful it may be in daily affairs, is, on account of its fevered and fretful activities, the greatest hindrance to the reception of the calming and refining spiritual influences flowing from the spiritual nature. Hence the idea is most certainly not that the psychological nature abandons, even temporarily, the constitution, for such an act would result in mere deep sleep or profound trance; but instead, the meaning is that this psychological nature is trained to be utterly still, as pellucid as a mountain tarn, receiving and mirroring the rays of the golden sun. In fact, the condition is not different in principle from what occurs in minor degree to one when he feels himself in the mood to receive a new and illuminating idea. Class III: is that of the avataras. The great difference which distinguishes the avataras from the individuals of Class II as well as of Class I lies in the following fact: in the cases of the avataras, there is no karmically natural personal intermediate or psychological vehicle which is their own as coming to them from former earth-lives; indeed, their intermediate part, forming the psychological link between spirit and the vital-astral physical body, comes to them from elsewhere. In other words, the avataras are human individuals, each one imbodying a divine ray, who have had no past and will have no future incarnations in earth-life. They are beings of extraordinary spiritual, intellectual, and psychical powers whose appearance among men is unique; and this is because they are not the reimbodiments of a human soul as all other human beings are. In fact, although they are men because working through a human body brought into existence in the usual fashion, they possess or rather are no "human soul" of their own as individuals, but are "created" by a supreme effort of divine white magic. Their appearance or rather their production among mankind is for the express purpose of bringing into action the spiritual influence of a divine ray in human history. To achieve this, the psychological apparatus is temporarily "given" to the production in order to furnish the necessary intermediate vehicle or "carrier" between the astral-vital-physical body and the ray from the waiting divinity. The word avatara is a Sanskrit compound and may be translated as "passing down," signifying the passing into lower planes of a celestial ray, or what comes to the same thing, of an individualized complex of spiritual force-substance — a divine or celestial being — for the purpose of overshadowing and illuminating a human vehicle which, during the time of such connection of "heaven with earth," of divinity with matter, possesses no karmically connecting psychological link between the spiritual ray and the physical body; in other words, no human soul born in that body and karmically destined to be the inner master of that body. The psychological or human link in the avatara is supplied by the voluntary entrance into the unborn child (to be followed later with the overshadowing of the celestial power) of the psychological principle of one possessing the status of buddhahood, who thus completes the constitution of the avatara. All this is a mystery, in the ancient Greek sense of the word, greater even than the mysteries pertaining to any individual of Class II. It may be of interest to name a few avataric figures in known history, which will allow the reader to make his own adjustments of the respective place held by each in the avataric hierarchy. Sankaracharya of India may be instanced as the case of a true avatara. He lived some few generations after the passing of Gautama the Buddha. Sankaracharya was a native of Southern India, and from earliest childhood to the day of his death he manifested transcendent capacity in spiritual and intellectual lines. He was one of the most noted reformers of orthodox Indian religious philosophy, and the founder of the Advaita-School of Vedanta, which even to this day is the most widely accepted school of Hinduism — and perhaps the most spiritual also. Leaving aside all matters of legend or myth, the main facts concerning the nature of an avatara and his entrance into the sphere of human history, may be summarized as follows: (a) the avatara is composed of three parts, each of a distinct derivation but united to form the avataric being. There is, first, the spiritual-divine part; second, the loaned intermediate or "soul"-nature; third, a karmically pure human astral-vital-physical vehicle; (b) the avatara is a production brought about at certain cyclical points in human history for the express purpose of introducing a direct and unimpeded spiritual influence into human affairs; (c) the avatara has no karma; is, in consequence, no karmic production in the sense of a reincarnation of a reimbodying ego, and hence as an individual has had no past and will have no future. The spiritual-divine part making the celestial "descent" has of course no human karma, because this ray is not of human origin, and hence there is no individual or racial karma attracting it into the human sphere. The appearance of an avatara is, nevertheless, governed by karma of a cosmic character — or better, perhaps, of a world character, "world" as here used meaning this globe of our planetary chain. Another instance of an avatara is that of Jesus; and, like all of his class, he had no merely human karma, except perhaps in the very minor sense in which the physical body may have its own karmic attributes, which were of short duration. The Esoteric Philosophy shows us that the psychological or "loaned" part of Jesus the avatara was almost certainly the same psychological entity which had furnished the intermediate human part of the preceding avatara, Sankaracharya; and, furthermore, this same intermediate entity which had been "loaned" in both cases is traceable directly back to Gautama the Buddha. A critical examination of the teachings both of Sankaracharya and of Jesus will reveal marks of intellectual identity in these two avataras. Unquestionably each had his own avataric work to do, and each did it grandly. While there are differences, it is the points of strong similarity, the identic intellectual atmosphere in both cases which are suggestive. There are also what one might call "minor avataras." These may be exemplified by what in theosophy are called messengers, i.e. individuals selected by the Great Brotherhood to go into the world as their representatives in order to do certain work among men. Such minor avataras are properly so named because of the fact that the psychological apparatus or psychomental being of these individuals is trained at times voluntarily to step aside in order to allow its own natural place to be taken by the projected will and intelligence of one of the great teachers, who thus, for the time being, becomes a "psychological apparatus" working in the otherwise normal constitution of the messenger. They are "minor" because it is only the psychological apparatus of such a messenger which is identic with the cases of the true avatara; but they nevertheless partake of an avataric character on account of the fact that the psychological apparatus working through the messenger is at times not his own, but on these occasions is, so to say, the "voice" or "mind" of the teacher. Otherwise the constitution of the messenger is unaffected and consists of the inner spiritual monad and the astral-vital-physical part, both of which function as usual. It is precisely because the messenger on these occasions of inner "inspiration" by his teacher becomes infilled with the holy spiritual fire of a greater soul, that the messenger is de facto an avatara of a kind. To instance the matter, take the case of the main founder of the Theosophical Society, H. P. Blavatsky. Ordinarily she was herself, in every sense of the word, and in full possession of all her powers and faculties of her normal constitution, highly trained as that was. But at times, the far greater mind of her teacher worked through her, impressing her brain-mind — and then she spoke like a prophetess, like the ancient oracle at Delphi; and there were times when, because of her training she would by a supreme effort of the will ally her own psychomental nature with the inner ray from her own spiritual monad, and the effect was similar but not identic with the other case of "inspiration" mentioned earlier. H. P. Blavatsky herself commonly made a distinction between these two parts of herself, as for instance, between what she called "H. P. B." and "H. P. Blavatsky." Moreover, in order to form what she called "the astral telegraph," a certain portion of her intermediate constitution was from the beginning of her public work, and even before, "resident" apart from the local framework of her constitution, this portion being actually with the teachers and most carefully guarded by them, from either injury or exterior contact. Many people marveled at what they called the contradictions of her character, which certainly existed, but largely because of this fact. The case of H. P. Blavatsky likewise illustrates the sharp distinction that is made in the Esoteric Philosophy between a mere medium (a helpless tool of erratic astral forces), and a mediator, a self-conscious intermediary between the Brotherhood and the mass of humanity. A mediator or transmitter is thus a highly evolved and specially trained human being, and is worlds apart from the medium who is an ordinary human being with a more or less dislocated psychological apparatus, the usually unconscious victim of almost every astral current of energy that may happen to flow toward him. Mediators or messengers are in no sense whatsoever suffering from self-psychologization or servile subjection to the will of any other, either of which would utterly unfit the individual to be a mediator. What the Brotherhood desires above everything else is the strengthening of the higher elements in the constitution of all men. This is particularly applicable to the mediators or messengers whom the Brotherhood itself chooses to do their work from time to time in the world. The knowing Self is not born, nor does it ever die; from no thing did it ever spring, for all things spring from it. This Ancient of Days is unborn, eternal, everlasting; it never is killed, though the body is killed. If the killer thinks that he kills, or if the killed imagines that he is killed, neither of the twain understands; for the one does not kill, nor is the other killed, in reality. The Self, smaller than the smallest, greater than the greatest, is hid in the core of every creature. The man who is free from desires and free from sorrow, sees the majesty of the Self through the tranquility of the mind and the senses. Such a man though sitting still, yet goes far; though lying down, he travels everywhere he will . . . The Sage who knows the Self as bodiless within all bodies, and unchanging among changing things, as greatest of all, and omnipotent, does never grieve at all. The idea here being that the man who merges his own personal egoity in the universal self or paramatman, is conscious of "immortality" even while he lives, for he has become at one with the consciousness universal in nature. The idea here is that this cosmic self is not only the immortal fountain of our inmost being, but the essence of our own spiritual consciousness. From it we come; we are through eternity as individuals inseparable parts of it. This universal self abides in the heart of every man and woman and whispers: "I AM"; what prevents us from understanding is the intermediate psychological nature, the human ego, which says, not "I AM" but the egoistic "I AM I." Immediately this lower voice is sensed, one loses the spiritual consciousness of universality, and exchanges it for the personal, limited, egoic sense; and as this happens with all of us, the result is the conflict of human interests rather than the recognition of common spiritual selfhood. But it should not be supposed from the above that the "I am I" consciousness is brought into being to perish finally as an unworthy thing; such a conception of the evolutionary work would be monstrous. There is a sublime destiny awaiting this human ego if it runs its evolutionary career successfully, which is that it itself must come to union with the universal within. The working of the material propensities in us is really a course of experience or growth in spiritual power, provided that the material propensities are not killed but turned upwards, and that their energies transmuted into spirit instead of backwards into identification with matter. Man's nature is brought into being from the spiritual monad, just as the universe on all its planes, visible and invisible, is the evolutionary unfolding of what emanates from its pneumatological summit or cosmic hierarch. The teaching of the Stoics as regards such emanational unfolding of the universe from the cosmic divine monad is virtually identical with the teaching of the Esoteric Philosophy. The main point in this teaching is that the cosmic divine monad, as the source or root of the universe, is considered to contain within itself as latent germinal seeds or element-principles the hierarchical planes and families of entities which during the course of the building of the universe later flow forth from it. Furthermore, each subsequent stage of emanational unfolding contains within itself its own svabhava as its dominating energy-substance, and equally contains not only the effluxes from the preceding plane, but likewise the germinal seeds of its own offspring. Thus from the cosmic divine monad there first emanates the cosmic spiritual monad, which imbodies not only its own particular characteristic of individuality, but likewise the stream from its parent cosmic divine monad; next there flows from the cosmic spiritual monad the cosmic intellectual monad or mahat, containing in itself not only its own svabhava but likewise the two characteristics flowing into it from its parent, the cosmic spiritual monad, and from its grandparent, the cosmic divine monad, and likewise there are in it the germinal seeds of the remaining four hierarchies which emanate from it in regular periodic order, thus building the invisible and visible structure of the vast cosmic entity. The bold-face capital letters represent the seven element-principles of the universe, or, considering the hierarchical constitution of the entity, these capital letters will stand for the different foci or knots of consciousness — otherwise the different monadic centers. Next, in the lines of the letters which follow each of the capital letters, the svabhava of each evolutionary stage is marked by a smaller capital which shows the identity of the svabhava of this stage with its originating source; the italicized letters represent the germinal seeds of succeeding hierarchies which lie latent in the parent, and which decrease regularly until G or the physical plane is reached, all the latent germinal essences then having been more or less brought into manifestation. The superscript numbers are merely added as an aid, and do not signify "powers" in the mathematical sense. Now the idea of this cosmic "procession from the godhead" does not mean that the lowest cosmic plane, G, is superior to the divine plane A, merely because the physical plane G is the unfolded and final expression of the hierarchy, for this conception would be absurd. The diagram tells us only that the physical plane is the common carrier of all the elements and principles of the cosmic hierarch which have preceded it. One of the most important points of this teaching of emanational evolution is that every plane on the descent is itself septenary, and therefore a copy in the small of the sevenfold universe, or, stated otherwise, every inferior plane, once that the sevenfold universe is unfolded, is a mirror in its own septenary nature of the septenary nature of the divine monad of which it is the descendent. The evolutionary progress and emanational unfolding, therefore, of the monad in its peregrinations through space and time consists of two distinct stages: (a) the unfolding from within outwards, through half the period of the cosmic manvantara of the manifested universe, every degree or stage downwards being the offspring of its immediate superior; and (b) of an inverse order or process during the latter half of the cosmic time-period, during which everything is again ingathered or involved, so that the material spheres which were the final unfolding during the first part of the cosmic time-period are the first in the reverse process to be infolded. It is the lower consciousness of man which must itself link itself, first with its spiritual monad, and then at the end of the cosmic manvantara conjoin itself anew with the universal consciousness; but ages before this final consummation in any single cosmic manvantara, there will be hosts of beings, once men, who through raising of the intermediate nature into union with the spiritual nature will become imbodied dhyani-chohans, and in proportion as they will attain self-conscious reunion with the cosmic self, in the same degree will the universal life play through them, much as the atmosphere of our earth is permeated throughout with cosmic electricity. If we could indeed "empty out" these petty little selves of us, and enter into the self-consciousness of impersonal spirituality, we should then indeed be like gods walking on earth, because we would then have become translucent mirrors through which the inner divine light could play unhindered. This self-forgetfulness means progressively greater allying oneself with the universal consciousness-life. It means throwing off the shells of our personal restrictions, living in the impersonal, and giving the cosmic love within our hearts free passage outwards to our fellows — indeed, to all that is. Self-seeking means constriction, limitation, therefore smallness; it means building around ourselves etheric veils of the lower selfhood; while self-forgetfulness brings ever greater service to mankind, and hence it is the true path, at the end of which is found reunion with one's own individual inner god. One is often asked whether the practice of concentration and meditation is useful in the winning of the greater self. The answer is that of course it is useful, but it should be that kind of meditation which is forgetfulness of self and emphatically not a concentration upon the self; it should be a concentration of the mind and of the heart to become one-pointed in thought, pressing upwards through all the personalized veils to reach the inner divinity. Concentration in meditation requires no outer nor artificial props of any kind; for, despite what the practicers of the lower forms of yoga which are so popular today may have to say, all such exterior aids are more of a detriment than a help, for the simple reason that they distract the attention outwards to themselves, and thus really tend to defeat the end in view. True meditation cannot ever be practiced successfully by the innately selfish man, or the mere self-seeker for powers; for in him the basis itself of spiritual meditation is lacking, and he starts from an entirely wrong foundation of effort. It may be said by many that meditation is too difficult for the average man to undertake with any hope of success, but such an idea is utterly wrong, and arises solely in the wish to attain at a single leap what is attainable only as the fruit of long and arduous effort. Like everything else that is worthwhile, it takes effort, but every single effort made, if constantly renewed, builds up an accumulation of spiritual force, making the true practice of meditation more and more efficient as time passes. Rome was not built in a day, nor is the mahatma the product of a single lifetime. We should strive to cultivate impersonality, therefore, which does not mean indifference to the world and its heavy burden of sorrow, but does mean a growing indifference to one's own small desires and yearnings, in order to become an ever stronger power in the atmosphere of the world to raise human standards. A man may meditate anywhere, and at any time; whether he be in his armchair or walking the streets of a city, he can with practice abstract his mind to things of the spirit, and yet be fully alive and self-conscious of what is going on around him. Such are the first stages of concentration in meditation. The later stages, however, are characterized by their own rules, and when the student has progressed into these stages, he will then find it needful for his meditating hours to seek a place of quiet, where he can, at least at times, enter into inner communion with the god within which in its highest forms makes him virtually to be an incarnate divinity himself. But these final stages are attainable only by the highest of men. The average man is so afraid of himself, and yet at the same time is so afraid of losing himself, that his contradictory fear becomes a terror; in consequence, he hunts for distractions everywhere. Anything is better, he thinks, than to be alone, to be himself! If he could but exchange the pains and fears of the limited personal life for the strength and wisdom of the spirit within him, then he would achieve that expansion of consciousness whereby the personal becomes impersonal, the small becomes the great and his self-consciousness becomes coextensive with the spirit of the solar system. During his moments of self-conscious communion with his inner god he will come to know that there are no mysteries, whether within or outside of himself, that are unsolvable: that there are no realms of the infinitely numerous universes in space which cannot be entered into and be understood, for in very truth, they are in their essence all within man's highest being. Yes, the mightiest god, could he come to earth and teach, could not make a man understand if the man himself had not that Master within whose habitat is the solar universe. This statement imbodies one of the most wonderful mysteries of the cosmos — to wit, how developed human spiritual egoity can self-consciously recognize its oneness with the universality of the cosmic spirit and yet retain its own individuality. Individuality emphatically does not mean "individualism." Individualism is usually sheer egoism; whereas individuality is one of the names given to the undying spiritual center within us, the essential selfhood of the monad which is the source of a man's whole being. When the "I am I" becomes the spiritual consciousness of the "I AM," that is, when the personal has expanded to become the impersonal, fully self-conscious of the divinity within itself — then indeed we shall have a race of buddhas and christs on earth. When this divine event occurs, then man will know, because he will be: his understanding of the personal will have become a self-conscious recognition of the universal in himself as his Self.